Netumo blog for internet administrators and website owners about the internet, websites, domains and Netumo. 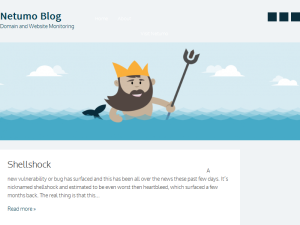 This what your Netumo Blog Blog Ad will look like to visitors! Of course you will want to use keywords and ad targeting to get the most out of your ad campaign! So purchase an ad space today before there all gone! All websites have issues even Microsoft sites. They can be on powerful servers and distributed across the world however it’s always important that you are notified as soon as issues happen. With Netumo you are immediately notified whenever there is a failure. 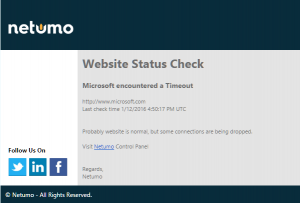 Netumo is intelligent enough to avoid false positives and notify you when truly the website is down. Get a free account from here. So I was stumbling the web using stumble upon and encountered a page …Bamm expired domain! Obviously I couldn’t access the site in question until I used the wordpress address. The same for all visitors, and any google searches since all links going to this blog were “dead” since the author obviously uses the domain to link to it and not the free wordpress address. Seems like he’s not using Netumo monitoring service which is Free! With every subscription automatic renewal is the norm; you purchase a domain name or you purchase a hosting package and set your account with the provider to an auto renewal subscription per year. Is it really safe and suggested to do so? The simple answer is YES definitely! Nobody wants to keep on paying for their domain/hosting over and over again. However don’t just reassure your mind that it will be automatically renewed as this depends on various aspects. Expired cards – Cards tend to expire every 2 years hence it is always good to keep note of where you enter your cards and make sure that you update them which can be a hassle for the numerous subscriptions. Credit Cards with insufficient funds. If for some reason the transaction does not go through you have problems. Tie to this the fact that sometimes email ends up in the Spam folder. So a word of advise add emails from your hosting provider and registrars to the safe senders list. For the rest out there that do not wish to set payments to auto renew, well they have a valid point as well. If you want to be in control of your expenditure and review before then you just need to make sure that you are advised correctly beforehand. If possible when purchasing purchase for multi year deals. They tend to be cheaper and also put the payment times in a less frequent periods. Put calender reminders when the date is due for renewal of such important payments. Create a Netumo account so that you are reminded whenever your domain expires or your website is down. 10 years ago it sounded too futuristic that a light bulb would be connected to the Internet and have it’s own IP address. For the non geeks this could still sound a thing of the future but well it fact and is part of the so called the Internet of Things (IoT). 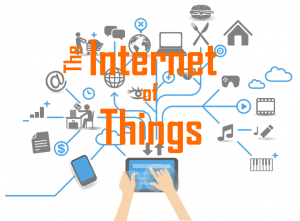 The Internet of Things basically means that everything is connected with all the advantages and disadvantages this brings. The ability to control and keep watch over your home from anywhere, the ability to live more comfortably are all very good examples of the advantages this technology brings. As to the disadvantages one must remember that it’s growing more complex to secure, monitor and maintain the network. With the Internet growing and reaching our devices the amount of failure points grows and troubleshooting such issues will get more and more complex without the right tools. The Internet of things has a vast wide of uses, like for example motion sensors used to detect if an intruder is in the house and when this happens it rings the alarm, gives you a call and notifies the local authorities. Or for example a wearable (smart watch) which monitors the heartbeat. As soon as it detects even the slightest of problems it calls the ambulance or the doctor. But what if any of these devices fail? Critical services like these should not be taken lightly. 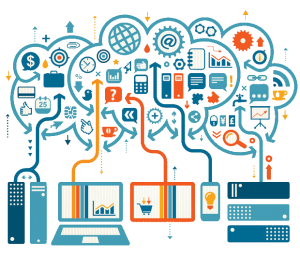 The Internet of Things brings a new era of monitoring into place where you don’t just need to monitor your routers, websites (the traditional so called IT services) and other IT services such as SaaS (Software as a Service) solutions. With the Internet of Things monitoring needs to be done on this vast amount of connected devices is pretty much infinite. This also brings in questions how alerting needs to be done in such scenarios, do you really want to get an SMS alert, tweet or email if a light bulb fails? But what about if the garage door is unaccessible? It might be simple one thinks and different alerting levels are required for the monitoring of these so called “things”. All this could make it a bit complicated. If any device is to fail normally it does on the exact day your really need it! The IoT brings new challenges here at the team of Netumo. We are constantly looking at ways to make monitoring easier and better. Monitoring is growing and will always be one of the crucial services any IT network requires both business and even home. For more information on Netumo and sign up for a free account click here. Netumo offers you a variety of web tools to help you analyze web content and understand better your website. This post explains these tools in a bit of more detail and give you some insight on them. 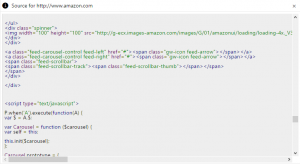 The page source is a utility to view the HTML source of a website. It’s fetches the HTML just like a web browser would do and displays it in colored syntax so that it’s easier for you to identify. Enter any IP address in the box and Netumo will tell you the country of origin of that particular address. Netumo manages to locate the country of origin of any website both IPv4 and IPv6. Netumo can fetch the WHOIS record for all publicly known WHOIS servers giving you a bit more insight on the owner of the domain name. It is important that you understand the speed your website takes to load. This utility measures the time the website takes to load for a new visitor including the time it takes for the web browser to download any resources. Visit www.netumo.com today to start monitoring your websites and internet hosts as well as be in control of your domains. If you are the owner of Netumo Blog, or someone who enjoys this blog why not upgrade it to a Featured Listing or Permanent Listing?